Italy has long had a reputation as one of the world’s most stylish countries with a wide-ranging influence on global fashions. However, one group of Italian fashionistas often get overlooked. You’ll recognise key features of their look from current trends, but maybe not the name. Let us introduce you to Paninaro style – a way of dressing that came from a fashion-obsessed bunch named after a sandwich shop. Nah, seriously. In early 1980’s Milan a cluster of young, wealthy Italians decided not to be part of the on-going political struggle for competing ideologies that was being played out at street level. After all, there was fun to be had, fashion statements to be made and even songs to inspire. They were fashion obsessed and wanted everyone to know. They looked modern, fresh and were themselves influenced by streetwear and styles from overseas as much as taking a patriotic stance with some of the labels they wore. Brightly coloured clothing along with a year-round tan helped them stand out from the crowd and attract attention. Even their name shows that, at the time, they were very much about the present rather than dwelling on the past. They embraced a new trend for fast food (rather than traditional slow-cooked Italian food) and so were named after Milan’s first sandwich bar, Il Panino where the original members would congregate. Paninari took heavy influences from Americana, Timberland being a key brand for them. Boots, like the 6 Inch Premium in the picture above, would be worn through the winter with boat shoes being favoured in the summer. 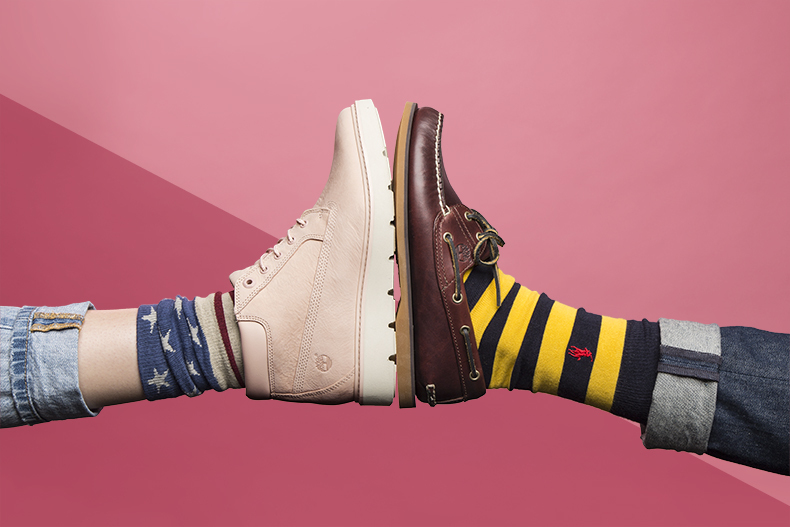 Boat shoes, in particular, would be matched with Burlington socks. The socks were revealed by another key feature of the Paninaro style, turned up jeans. When we say turn-ups, we’re talking serious turn ups here, often revealing almost half the shin. You’ve probably been seeing a lot of this lately with the tight is right approach to denim being replaced with slightly looser straight fit jeans turned up to reveal a sweet bit of prime cotton. Another notable calling card of Paninari was a love of Italian athleisure clobber, with Superga trainers being a particularly popular choice of footwear. 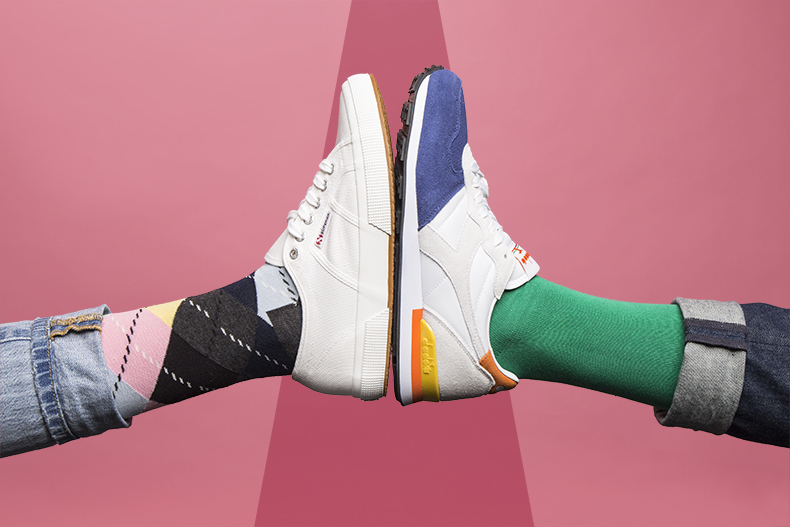 Today, we’re seeing a revival of what are now Italian heritage sportswear brands, with Diadora, ellesse and FILA all dropping some hot kicks this season. The athleisure element of the look was about more than footwear; down jackets were cherished among this crowd- the brighter the better. Again, this is something that you’ll have noticed more of over the last couple of years. The puffa style jackets have gone from being protection from biting cold for hardy souls who think its fun to climb a mountain in winter, to being worn in more urban environments. From a small group in a Milanese sandwich shop, the Paninaro look spread to other Italian cities. They weren’t interested in remaining underground like some other sub-cultures. It’s a good job too; it would have been a challenge in those bright colours. Their continental take on a preppy look inspired future trends, but they also left a legacy that transcends fashion. We’re not claiming they were single handedly responsible for the popularity of the sandwich though, steady on. However, there were various magazines that started being published to cater to this movement, the picture above is just one of them. They were the inspiration for one of the characters played by Enzo Braschi in his TV show Drive-In, which led to a film named The Italian Sandwich. We’re guessing a kind of Ali G of that time…but at least their clothes looked good. Musically, Paninari were huge fans of British pop acts, songs like Wild Boys by Duran Duran and The Edge of Heaven by Wham were well loved by the urbane members of this sub-culture. Even better than that though, one of their favourite acts, The Pet Shop Boys wrote and released a song all about them, simply titled Paninaro. Quite a result for a group that started by hanging about in a sandwich bar. There you go, what started as a few kids wearing bright colours in a fast food joint ended up leaving a lasting mark on popular culture and their influence on street style continues to be seen. Right, history lesson over, time to stick on some synth-pop, roll up your jeans and put some tasty fillings between a couple of slices of bread.